SEYCHELLES – 2017 – The most stunning island in the Seychelles is now open to travellers from the Middle East to explore fully for the very first time. Silhouette Island can now be discovered by air, land and sea on short break trips from the GCC. Surrounded by coral barrier reefs, it is home to Hilton Seychelles Labriz Resort & Spa, the only resort on this truly magnificent island. Guests can sail or helicopter around the island, which boasts a Jurassic Park-style landscape, before landing on secluded beaches to meet locals, interact with 125-year-old giant tortoises in their natural habitat and cook breadfruit straight from the tree on open fires. The island’s white sand beaches surround a mountainous interior. Those with the energy can make the 10km trek from one side of Silhouette to the other – taking in the incredible views and wildlife. Once owned by pirates, Silhouette Island was taken over by the Dauban family in the mid-19th Century. Originally from France and settled in Mauritus, the family were responsible for developing its extensive plantations. Following its purchase by the Seychelles government in 1983, Silhouette Island was then home to a small hotel, which was later replaced by the larger Hilton Seychelles Labriz Resort & Spa. Silhouette Island is also believed to be where the famous corsair Jean-François Hodoul buried his treasure. Hilton Seychelles Labriz Resort & Spa are offering fully flexible packages to its guests from the GCC, who are only a short direct flight of just four-and-half hours away. These customisable deals allow them to combine rooms, schedule itineraries that fit exactly with what they want to do during their visit and tailor F&B deals to suit these plans. 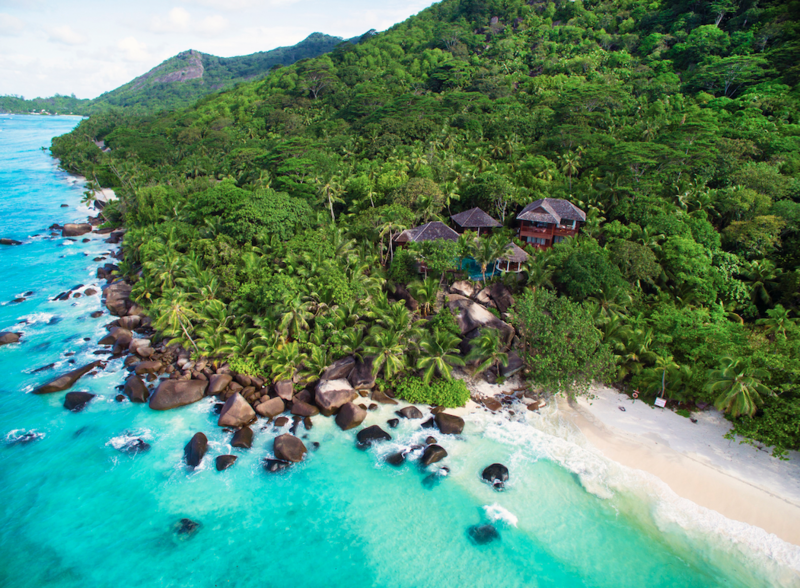 “Silhouette Island is breath-taking and the feedback from those on short stays from the Middle East was that they wanted to see as much of it as possible,” said Andre Borg, General Manager at Hilton Seychelles Labriz Resort & Spa. The resort boasts the most well-equipped diving centre in the Seychelles, and in 2017 they are running special courses which allow guests to learn the basics and then head out to sea – all in the same day. The resort has the only 5-star Certified PADI diving centre in the region and scuba divers will be drawn to the coral reefs lining the outer edges of the island. The intrepid traveller can choose from an assortment of activities ranging from snorkelling and water sports to big game fishing. Silhouette Island has a barrier reef with some of the healthiest coral in the Seychelles and its sheer granite cliffs make for some spectacular diving even down to depths of 35 meters. Night diving is safe here as the water is warm and very clear. Recently, guitar sharks have been spotted along the seabed, a rare sighting for avid divers. Silhouette Island shelters a huge diversity of flora and fauna, from the incense tree to 125-year old giant tortoises. Well-maintained trails allows visitors to explore beaches and parts of the rainforest. 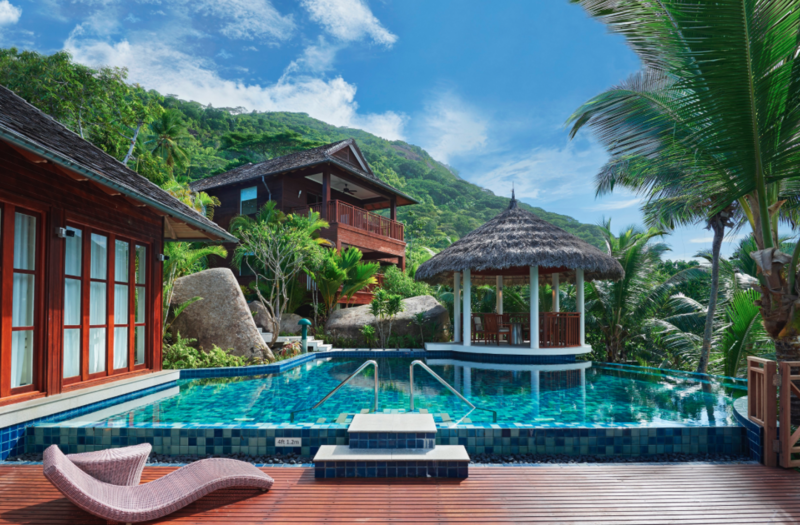 For those looking to unwind and relax, Hilton Seychelles Labriz Resort & Spa has Eforea Spa offering the ultimate escape with customisable treatment packages. Snuggled on a hillside between ancient rock and sprawling jungle, the stunning retreat is comprised of six couple treatment suites set upon stilts amidst a magical landscape where guests can experience a total sense of wellbeing. 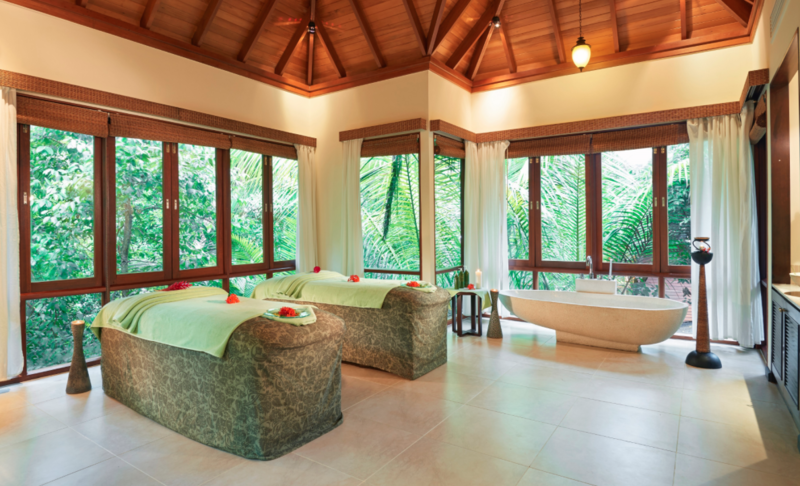 A popular treatment, ‘Just for Two’ is perfect for the honeymooning couple who can enjoy a blissful two-hour treatment including a soothing foot bath, a body massage with nourishing oils, and a calming facial – all performed by experienced therapists.